Canine Alert Search Teams hasn't added a story. Canine Alert Search Teams is holding an International Search and Rescue Dog trial in Hancock, NH August 16-18 2013. We have teams coming from all over the US and all over the world to compete and get certified by IRO judges from Germany. We are a volunteer K9 SAR team and funds donated will be used to help alleviate the cost of food, interpreter, site location preparation and maintenance as well as ribbons and trophies for our event. 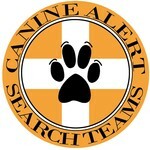 Canine Alert Search Teams hasn't posted any updates yet. Canine Alert Search Teams is managing the funds for this campaign.